Major League Baseball on Monday approved a historic deal that will put Alex Rodriguez in pinstripes. 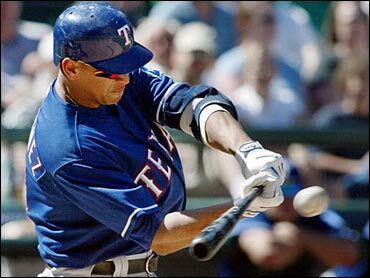 Baseball commissioner Bud Selig cleared the way for the Texas Rangers to deal the hard-hitting shortstop to the New York Yankees. The teams and the players' union approved the terms of the deal on Sunday. Rodriguez, who counted the New York Mets as a favorite team when he was a boy, is expected at Yankee Stadium on Tuesday for a news conference welcoming him from the heart of Texas to Steinbrenner country. The New York Post says number 13 has been reserved for the newest Yankee. Texas will pay $67 million of the $179 million left on Rodriguez's record $252 million, 10-year contract, the biggest transfer in a baseball deal, and will get All-Star second baseman Alfonso Soriano and a player to be named. "I am very concerned about the large amount of cash consideration involved in the transaction, and the length of time over which the cash is being paid," Selig said. "I want to make it abundantly clear to all clubs that I will not allow cash transfers of this magnitude to become the norm. However, given the unique circumstances, including the size, length and complexity of Mr. Rodriguez's contract and the quality of the talent moving in both directions, I have decided to approve the transaction." Soriano isn't the only thing Texas gets out of this deal, says Rangers general manager John Hart. "It's about flexibility," explains Hart. "We're trading the best player in the game and we're getting tremendous financial flexibility." Rodriguez will move from shortstop, a position at which he's been a seven-time All-Star, to third base, where he will replace injured Aaron Boone. The Yankees will keep their captain, Derek Jeter, at shortstop. "I don't think he ever thought about playing another position until the concept came up," said Rodriguez's agent, Scott Boras. "He decided it didn't make a difference — shortstop, third base, center field. He wanted the opportunity to play on a competitive team." The trade came as a shock to many — particularly the Red Sox, who had hoped they'd be the ones to acquire the 28-year-old, 6'3" baseball phenomenon. "The Red Sox had a chance to get this done," one baseball official told The New York Times, commenting anonymously. "They thought in the end, there was no other competition." The players' union did not like the Red Sox offer, however — evaluating it as a reduction of Rodriguez's contract — the richest in baseball history. The Yankees offered more, and Rodriguez was reportedly eager to leave Texas. "They had a clubhouse thing that was intolerable," one source told The Times. "Alex told people this winter that the thought of going back to Texas was driving him crazy." "The Yankees' resources gave them the capability to do what no one else could do," said Red Sox president Larry Lucchino, who has referred in the past to the Yankees organization as the "evil empire." "But you have to give them credit for their aggressiveness and for going out and making it happen." The Rangers will wind up paying $140 million for three seasons with Rodriguez, an average of $46.7 million annually for three last-place finishes in the AL West. The Yankees will owe him $112 million over seven years. Baseball's biggest spenders will raise their payroll to about $187 million. "The disparity is not healthy for the sport," Arizona Diamondbacks owner Jerry Colangelo said. "But everyone runs their team the way they see fit, and they did it by the rules." Also commenting on the trade was President Bush, a former owner of the Rangers. "I was just as surprised as the Yankee fans and the Boston Red Sox fans when I opened up my paper," Mr. Bush told NBC as he took in Sunday's Daytona 500. "It, obviously, is a big deal … A-Rod's a great player and the Yanks are going to be a heck of a team with him in the infield." Boras said the possibility of a trade first came up last Monday while he was talking to the Yankees about another player. Boras then called Rodriguez. "I said, 'There may be an opportunity. We have to talk about your goals, about winning,"' Boras recalled telling his client. "He called me back Tuesday and discussed it further and said, 'Why don't you call (Texas owner) Tom Hicks and let him know we're ready to do that,'" Boras said. Trade talks began the following day, and the sides reached the agreement Sunday. Under the deal, the Yankees will pay Rodriguez $15 million in each of the next three seasons, $16 million each in 2007 and 2008, $17 million in 2009 and $18 million in 2010, according to contract information obtained by the AP from player and management sources. In each of the first four years, $1 million would be deferred without interest, to be paid in 2011. The trade calls for Texas to pay $43 million of Rodriguez's salary over the remaining seven years: $3 million in 2004, $6 million each in 2005, 2006 and 2010, $7 million apiece in 2007 and 2009 and $8 million in 2008. In addition, the Rangers will pay the $24 million remaining in deferred money from the original contract, with the interest rate lowered from 3 percent to 1.75 percent. All the deferred money owed by Texas — $36 million, including salaries from 2001-03 - will be converted to an assignment bonus, which makes the money guaranteed against a strike or lockout. The payout schedule will be pushed back to 2016-25 from 2011-20. In exchange for the alterations, which devalue the present-day value of the contract by $5 million, the Rangers will buy Rodriguez's home in Texas and his luxury suites at The Ballpark in Arlington and American Airlines Arena. In a 21st century twist, Rodriguez will also reportedly get a new perk: permission to link his web site to the Yankees' official web site. While the Rangers appointed Rodriguez team captain on Jan. 25, Boras said that once Texas decided to go with younger players, it became apparent a change was needed. "Because of the change in direction in payroll in Texas, we didn't think Alex was the fit there he was before," Boras said. "This trade was a situation that would benefit everybody."